What’s So Funny About OR Nursing? OR Nurses: this book is for you! I count the years I spent as an OR nurse as some of the finest (and funniest!) of my career. Talk about the tight bond between nurses! I learned true caring, compassion, and grace-under-pressure from my colleagues behind those double doors. There were also lots of laughs – and thank goodness for that. Laughter provides the emotional resiliency we need to operate at the top of our game in the high-stress, high-pressure OR environment. Nurses who laugh regularly enjoy considerable physical and mental health benefits. They also tend to have stronger, more positive relationships with their colleagues than their more serious counterparts, and report higher levels of career satisfaction. 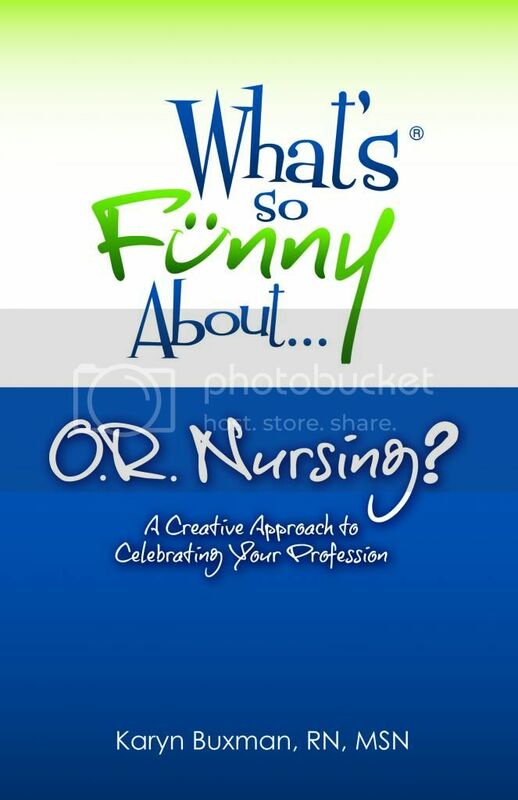 In my new book, In my new book, What’s So Funny About… OR Nursing? : A Creative Approach to Celebrating Your Profession you’ll find the latest psychoneuroimmunological research that explains why this is true, as well as practical, easy to implement strategies to add more humor to your life. Who doesn’t want to have more fun on an everyday basis? Using funny stories and real-life examples from health care’s front lines, What’s So Funny About… OR Nursing? teaches you how to recognize, incorporate, and benefit from the presence of humor in your practice. It’s a fun read that will make a real difference in your everyday work life. Best of all, it’s available on Amazon right now! So don’t delay: this is your chance to be the first nurse in your hospital to have a copy! I’ll admit it – when I first saw this restaurant sign featured in the Huffington Post, I laughed out loud. Chances are you did too! Businesses that offer their customers a way to laugh gain a significant competitive advantage. Humor is disruptive. It attracts our attention and makes us change the way we think. The Mexican restaurant advertising “Free Tacos – Yesterday Only!” will make us laugh, but they’re also planting that seed reminding us how much we like tacos. Couple that with the powerful emotional associations people have with humor, and you’ve got circumstances that predispose the customer to stop in and have a quick bite to eat! As business owners, it’s important to be sensitive to the emotional environment your customers are experiencing. When things are downbeat, the way they are right now with our turbulent economic and political situation, deliberately using your messaging to introduce humor and joy into your customer’s day is a wonderful gift. People enjoy laughing. Even if you’ve never engaged with someone – never talked to them, never made a sale – if you’ve made them laugh, people feel like you’ve done something good for them. This has an obvious positive impact on the relationship they’ll have with your organization going forward. Consider your business signage. Signs present an easy, no-cost way to introduce some laugh into your customer’s day. You already have the physical infrastructure in place! If you make a habit of posting funny messages, your customers and area residents will get begin to seek out your business specifically to see what funny thing you’ve said today. Handwritten signs in your businesses’ interior, the use of chalkboards, and even table tents can all incorporate humor. The laughs will help build your business – and that’s something you can smile about! Are you looking for ways to add more humor to your life? You should be! Laughter has tremendous benefits for our physical well-being, emotional resiliency, and social connections. Humor is power! When we laugh, we gain both a broader perspective on the world and a strengthened sense of being in control of our life. Damn You Auto Correct! What happens when Auto Correct goes wrong? More than a little profanity, but laugh out loud funny. xkcd A smart and funny webcomic – scroll over the comics to see hidden text that can make the gag even funnier. ebaum’s world Short funny videos you’ll want to share with your friends. What are your favorite humor websites?